I recently was using Beat Designer and noticed several workflows which make it more useful when adding to a VI plugin track for various uses. Beat Designer uses vary and it may be a decent idea to completely forgo small changes to it in favor of what might be considered a all new track type, akin to instrument track. It may be best to place the "midi insert" in front of the track (before the midi insert chain) to allow for modular-like routing such as parallel outputs or inputs. Issue I found was that there is no way to rename the drum hits (that I have seen so far). Usually, using this plug is best for other VI's where hits are most probably not the same naming configuration. When auditioning different hits I thought it could be much nicer if the selector window would stay open and not close after one click (because like above) not knowing what sound it would trigger. Using a naming-scheme not gonna work with other plugins, it's only guesswork. Or maybe have a few standards quickly available - like GM, Roland, etc. If there was a renaming feature it would be nice if when renaming only 1-click opened the renamer with the cursor in place so the user can begin typing right away. Also, when renaming hits in succession - after typing 'enter' key as finished, the next hit is automatically selected. When selecting hits, I can't select below C0. Very common to have samples at -C2, such as Kontakt. Re: Beat Designer suggetions thread.. I have long wanted MIDI channel assignment for each drum as a way to control output. Ultimately, I found a work-around to do it, but it was better to use the note values. You're right about the naming issue. Drum maps are more trouble than just living with it. BD has a wonderful set of features and a nice interface. I prefer it over the drum editor. The difference is that BD doesn't have a relationship with the MIDI recorded on a drum track. It's a sequencer with an internal memory. There's a problem coordinating that memory with the MIDI track(s). BD would make a fine MIDI track editor, eliminating the problem. Yes, we can import and export MIDI from BD, but it's an irritating extra step. Among other things, you have to deactivate BD after export to MIDI, lest you produce duplicate MIDI events. I like Beat Designer and I've just been getting more into it of late. 1. Improve visibility -- it's too subtle. 2. Allow drag and drop sample integration with Groove Agent SE (Drag Sample from Media Bay, Drop onto Beat Designer note, sample is assigned to Groove Agent Kit for that Note. H/t to whoever it was that suggested this. 4. Color the notes by pitch, chord track match, or Groove Agent Kit's assign colors. Velocity only is adequate, but other settings would be helpful. A few things I like about BA. The patterns in a sub-bank can vary in length and quantize value. The ability to adjust velocities in various ways is nice -- seems easier to get a sample to switch in beat designer than Drum or Key Editor. Helps keep patterns organized with songs/styles. Beat Designer in the lower zone! +10 ...In the lower zone. Allow automation of pattern switching to be recorded. Allow lane trigger notes to be learned by playing on controller. I've made several posts for years with suggestions on updating beat designer. I just made thread Requesting from Steinberg a Drum Sequencer just like the one that the people from PreSonus just implemented into the latest version of StudioOne 4, it makes Beat Designer look like a toy, which in all honesty, it is. 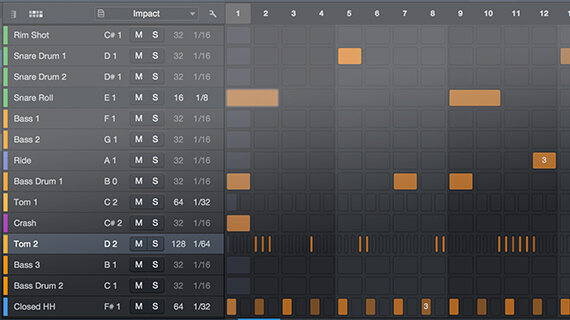 Agreed, a beat designer/step sequencer for drums is a must. It can be added to Groove Agent, but ideally come with Cubase, with a minimum of 12 channels. Ability to save kits with a sequence/pattern saved for each kit, so you can quickly move through kits (which will grow no doubt) and perhaps it automatically plays back it's default pattern you saved for each particular kit. See what VPS Avenger does with it's drum sequencing, something similar. Going through different kits may push you towards a different genre of music, because of the drums. The important thing to remember is you want efficiency, ideas can come and go quickly, so you want to be able to capture as much as you can as quickly as possible. If you think about it, vast majority are producing music with beats in them, so it's very central to the production, and having the ability to quickly get the drums you want on a track, to be able to sequence the drums in an easy way (not using the piano roll), large screen/buttons would help a great deal. 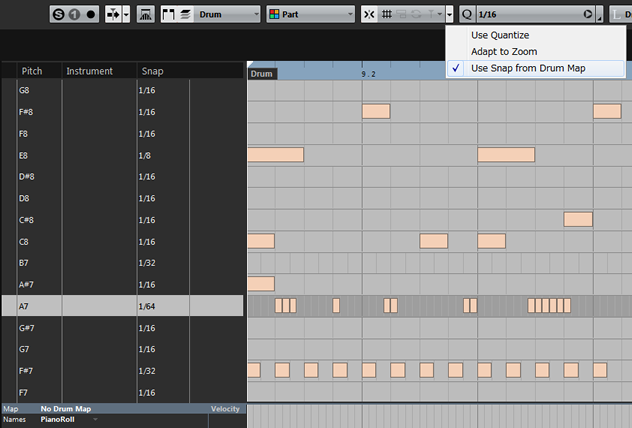 The reason I really like that Studio One 4 sequencer is you're able to change each individual sound to 1/4, 1/8, 1/16, etc. You can do that with "Drum Editor" of Cubase. "Shared Copy" is useful too. I really do need to update my instruments. Soon. This seems really easy to implement, and would be a great use of the lower zone. The amount of time it would save is immeasurable. I guess there's always Cubase 11! + 1 all the way!